Bracio: Brew Beer: Freezing Goo ... it just wont do. Freezing Goo ... it just wont do. While making starter wort - from the old tins of good that were on chuck-out at the supermarket - the stuff was dribbling and sticking everywhere as usual. 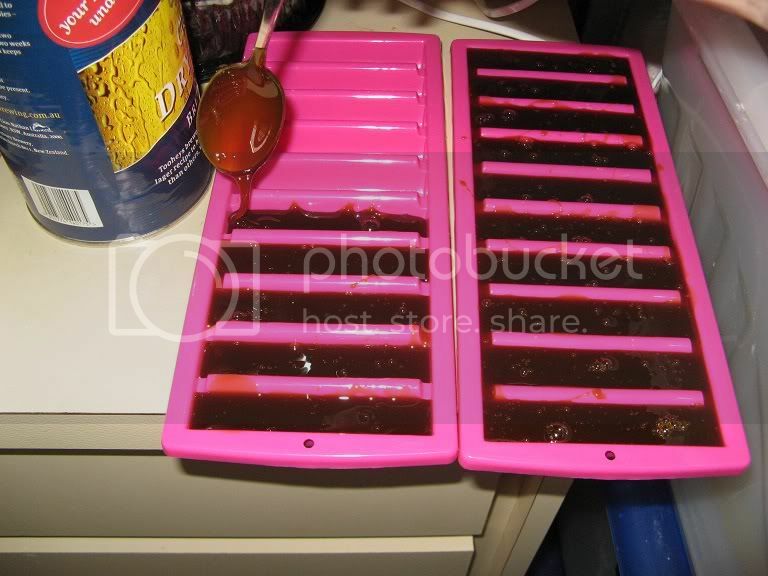 We have some large stick-ice-cube-trays so I thought it would be a good idea to freeze the goo so that it could be distributed without mess the next time I wanted to use it. The idea was that a single 'stick' of frozen goo could be put in the starter without all the mess of having to measure it out each time. While the theory was good, after spending a few days in the freezer the goo was still as runny and sticky as ever, I guess that the super-high sugar-content means that it doesn't freeze until it's much colder than the beer-fridge wanted to make it ... so much for that idea, now I have to clean the mess off the bench and out of the ice-trays. All that Grain ... and nothing to Brew.